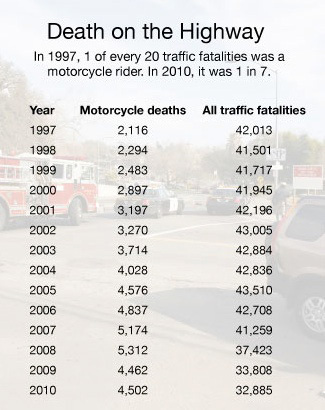 US motorcycle deaths have more than doubled since 1997. Bikers’ response: Leave us alone. In recent years, even as deaths on the nation’s roads and highways have fallen to their lowest levels in more than a half-century, motorcyclists are dropping like flies. Fatal crashes involving motorcycles have more than doubled since 1997—they now account for 1 in 7 traffic deaths, killing some 4,500 bikers (PDF) a year. So how are riders’ groups responding to the carnage? In short, by lobbying Congress to make regulators leave them alone. If the bikers have it their way, the nation’s chief traffic cop, the National Highway Traffic Safety Administration (NHTSA), will no longer be able to fund state police checkpoints to ensure that motorcyclists are wearing helmets that actually work—as opposed to the stylish-but-useless novelty numbers many bikers wear to get around state helmet laws. Last year, meanwhile, lobbyists for motorcycle groups derailed a proposal that would have reinstated financial penalties for states that lack helmet laws—similar to the federal pressure that pushed states to adopt compulsory seat belt laws. And bikers’ allies in Congress are working to reaffirm a gag rule that since 1998 has barred NHTSA from encouraging state and local leaders to enact motorcycle safety measures. The Michigan repeal was opposed by more than two dozen medical and public health groups, led by the Brain Injury Association of Michigan. A poll (PDF) conducted around that time indicated that 80 percent of likely Michigan voters wanted to keep the helmet law intact. And while the repeal legislation requires bikers to carry at least $20,000 in medical coverage, critics say that sum won’t come close to covering the costs of a catastrophic injury. Not to mention the death toll: With more bikes on the road and fewer states requiring helmets, motorcycle fatalities have ballooned from 2,116 in 1997 to 4,502 in 2010 (see chart). The 2011 stats aren’t out yet, but among the thousands dead were 55-year-old Philip Contos, killed during a rally to protest New York’s helmet law—police say he would have survived had he worn one—and 17-year-old Caroline Found of Iowa City, who died after her moped struck a tree. In fact, helmet requirements are widely considered the most effective tool at the regulators’ disposal. According to NHTSA chief David Strickland, “No other single countermeasure offers a comparable body of supporting scientific evidence confirming its potential for saving lives of motorcyclists.” The agency estimates that motorcycle helmets saved 1,483 lives in 2009 (PDF), and that another 732 American bikers would be alive today had they been wearing one that year. NHTSA has also estimated that helmetless riders cost society some $1.3 billion a year in medical expenses and lost productivity. “If you don’t wear a helmet, and you sustain a moderate to severe injury that doesn’t kill you, you are going to be a drain on society for the rest of your life,” explains Thomas J. Esposito, chief of the Division of Trauma, Surgical Critical Care and Burns at Loyola University Medical Center in Chicago. Other studies have shown that while training helps riders pass basic skills tests, their odds of crashing after six months on the road are about the same as those of an untrained rider. And even if training does make some motorcyclists safer, public health advocates argue that relying on it exclusively is like telling people who take a driver’s ed course that they no longer need seat belts or car seats for their children. That motorcyclists have managed to evade the sort of regulation that has made seat belts and car seats standard equipment speaks to the power of a vocal minority whose libertarian message resonates with lawmakers. The bikers’ groups are funded by manufacturers that have nothing against helmets per se, but are loath to offend their most vehement customers. The American Motorcyclist Association—whose corporate members include Harley-Davidson and North American divisions of Yamaha, Kawasaki, Honda, and Suzuki—has spent $3.8 million lobbying Congress on helmet laws and other issues over the last decade, while doling out more than $200,000 in campaign contributions, according to OpenSecrets.org. The Motorcycle Riders Foundation spent $2.1 million in lobbying during the same period. These groups also maintain armies consisting of thousands of grassroots volunteers who are always down for a good protest ride, and are ready to make plenty of noise when called upon. 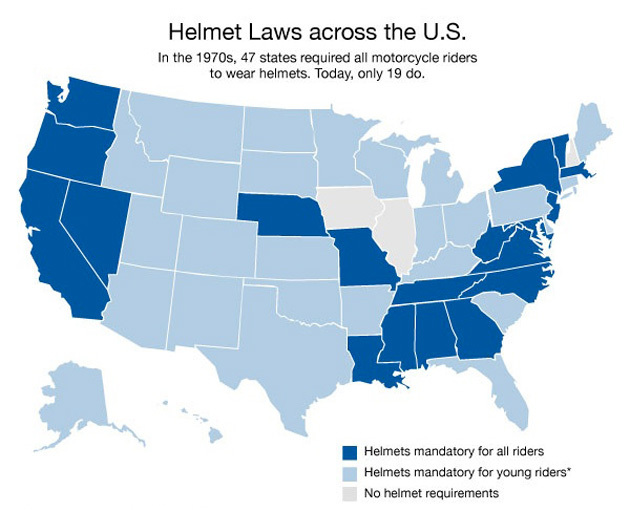 That’s the force Sen. Frank Lautenberg (D-N.J.), a longtime supporter of mandatory helmet laws, ran up against last December, as he was poised to propose a bill that forcing states to pass helmet laws or else lose millions in federal highway funds. In the mid-1990s, NHTSA began encouraging states to pass helmet laws, and set aside $330,000 to educate legislators on the issue. One of the components, a video titled “Without Motorcycle Helmets, We All Pay the Price,” featured testimonials from crash survivors and a trauma room physician who compared helmets to “a vaccine” because of the compelling evidence that they reduced brain injuries. Controversy ensued when the Motorcycle Riders Foundation circulated an early cut of the video to its congressional allies, complaining that NHTSA was using tax dollars to lobby against the interests of taxpaying bikers. They found a champion in Rep. Jim Sensenbrenner (R-Wis.)—Harley-Davidson is headquartered in Milwaukee—and in 1998 Congress passed a sweeping measure barring NHTSA from influencing state and local legislators on any pending legislation. Representatives of the agency may appear as witnesses, but only in response to an official invitation. More recently, after NHTSA signaled a renewed interest in promoting helmet use, Sensenbrenner sponsored a House resolution that would reaffirm the gag rule. And last year, when NHTSA earmarked $350,000 to help state police set up roadside safety checkpoints for motorcyclists, Sensenbrenner introduced a bill that would sever funding for the program. His resolution, which attracted 18 cosponsors, is now in the hands of a House subcommittee, while the ban on checkpoint funding is with a House-Senate conference committee working on a long-term surface transportation bill. The aim of the state checkpoints, in part, has been to crack down on so-called novelty helmets, which account for an estimated 1 in 5 helmets on the road. They are lightweight, come in various styles, and help riders keep police off their case. But they’re worthless in a crash. “They are just plastic toys, essentially,” says Tim McMahon, a California personal injury lawyer who won a $1.7 million award for a Fresno man who sustained brain damage while wearing a novelty helmet he thought was safe. Instead, the bikers’ groups insist that NHTSA, which has doled out more than $30 million in training grants over the years, should step up that effort. “The federal government says all day long: ‘You guys are a huge problem. You are killing yourselves out there. You need to start wearing helmets.’ But then they do not want to put resources” toward training and accident prevention, says Jeff Hennie, a DC lobbyist for the Motorcycle Riders Foundation. Does This Look Like a Motorcycle?